Simply put, its the cash required by a business to pay its suppliers, expenses and staff. It goes in a cycle as shown in the illustration above. When you start a business, it will take some time to start making profits and you will need sufficient cash reserves to continue operations. This is what investors mean when they ask how much working capital is required or the ‘cash burn’ until the business is profitable and cash positive. The technical definition of working capital is that it is composed of net current assets – that is debtors, inventory and cash which are current assets less creditors and any overdrafts and short term loans which are current liabilities. Usually all these should be convertible within a short period, in weeks, months and certainly under one year. If your current assets exceed current liabilities, then your working capital is positive and if reversed then negative, giving you a headache in the short term since you won’t be able to pay your suppliers or your staff. The ratio usually used for measuring working capital or liquidity as some people call it is current assets divided by current liabilities. The bigger this number, the higher the liquidity and better position for the business to be. You can also also use another ratio to check on how much working capital per sales you have from the calculation below. 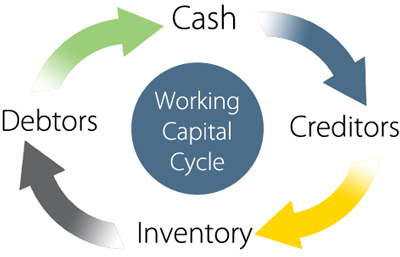 You need to manage your working capital by managing the elements within the cycle as efficiently as possible. I have written about credit control and managing suppliers before and these methods are critical to managing your working capital. Although I have given the ratios that apply to working capital, I have hardly used these ratios when managing businesses. The most effective tool I have used is cashflow forecasting and the tighter your working capital, it needs to be done daily and at least weekly. Cashflow forecasting ensures that every payment the business has to make, whether weekly, monthly, quarterly or annual is not forgotten. It is easy to forget some quarterly payments like VAT, rents and also the annual corporation tax. Businesses that have short term working capital problems for whatever reason usually get bank overdrafts and the usual request from the bank is to ask for cash flow forecasts with comparisons to the actuals as you work through the cycle of increasing working capital. Banks do not want usually to increase overdrafts, so effective working capital management is essential. You can be hit with an unexpected problem even following this advice, so always have a good relationship with your bank manager!